FC Halifax Town missed the chance to edge away from the National League relegation zone as they lost a poor game 1-0 at Bromley. Halifax can’t be too picky in their current predicament, and the cold, hard maths of the table and Town’s packed schedule dictated a draw was a more than satisfactory outcome. And they looked to be heading for a point until Adam Cunnington, once rumoured to be a Town transfer target, broke Town’s resolve 15 minutes from the end. The hosts will probably have played better than this and lost this season, but still did enough to earn their win against a Halifax side who defended diligently but never got going in attack. Shaquille McDonald’s reward for his recent heroics against Gateshead and Southport was his first start since the 5-0 win over Tamworth in mid-December, and his first league start for The Shaymen full stop. But the game picked up where the Southport match left off, with both sides conceding possession far too cheaply and doing little with the ball when they had it, meaning McDonald had little to work with. 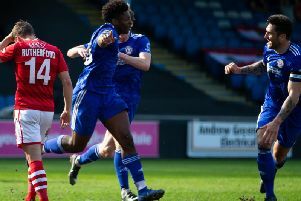 Moses Emmanuel, who scored at The Shay earlier this season, should have netted his 20th league goal of the season with the first chance of the night 15 minutes in but fluffed a simple tap-in from six yards by putting it wide. Lee Minshull was then only denied a goal from similar range by a last-ditch block by Scott McManus. If a point was considered a decent result beforehand, it was looking an even better outcome 20 minutes in. While McDonald was feeding on scraps at one end, Emmanuel went close again with a neat turn and shot that dribbled inches wide of the far post. Joe Anderson’s header was then held by Sam Johnson as the traffic continued to be mainly one-way. What traffic there had been gradually ground to a halt, although Pierre Joseph-Dubois saw a speculative shot flash wide a few minutes before the break. It had been a containing job for The Shaymen in the first-half, who fielded Kevin Roberts in the middle of a back-three, with only a blocked effort from McDonald of note going forward. But the visitors had carried out their task with discipline, if not much adventure, and a goalless opening 45 minutes was a case of job done. Town’s satisfaction with the game by half-time was illustrated by Jim Harvey, consigned to the stands by a touchline ban following his stadium ban on Saturday, only being given cause to shout out once in alarm. Minshull went close again with a shot across goal shortly after the restart, with Alan Julian still to be tested in the Bromley goal. Bromley began to grow in frustration as the second-half wore on, with Matty Brown and Hamza Bencherif growing in stature and restricting Emmanuel to a spectator. Bromley, perhaps aware of Town’s threat on the counter-attack, were reluctant to commit too many bodies forward, and subsequently saw their two strikers outnumbered in attack by the visitors’ three-man defence. The hosts then paid Town a back-handed compliment by taking off Emmanuel with a quarter of the game to go. Bromley looked out of ideas by now as the chances dried up completely, with Halifax offering nothing in attack, but the same could now be said of the hosts. That was until a superb run by substitute Bradley Goldberg, who had replaced Emmanuel, before his deft pass played in Cunnington and he fired the ball unnervingly across Johnson. That at least stung Town into action and their first, and only, shot of the night, which saw Bencherif hit the post from a corner. From the stands, Harvey was shouting for more urgency from Town in the dying minutes, but it was too little too late. Bromley: Julian, Holland, Anderson, Francis, Swaine, Chorley, Minshull, Joseph-Dubois (Dennis 78), Gordon, Emmanuel (Goldberg 69), Cunnington (Fuseini 88). Subs not used: Coombes, May. Halifax: Johnson, Bolton, Brown, Bencherif, Roberts (Hughes 82), James (J Macdonald 75), Wroe, Hibbs, McManus, S McDonald, Burrow (Peniket 82). Subs not used: Porter, Walker.